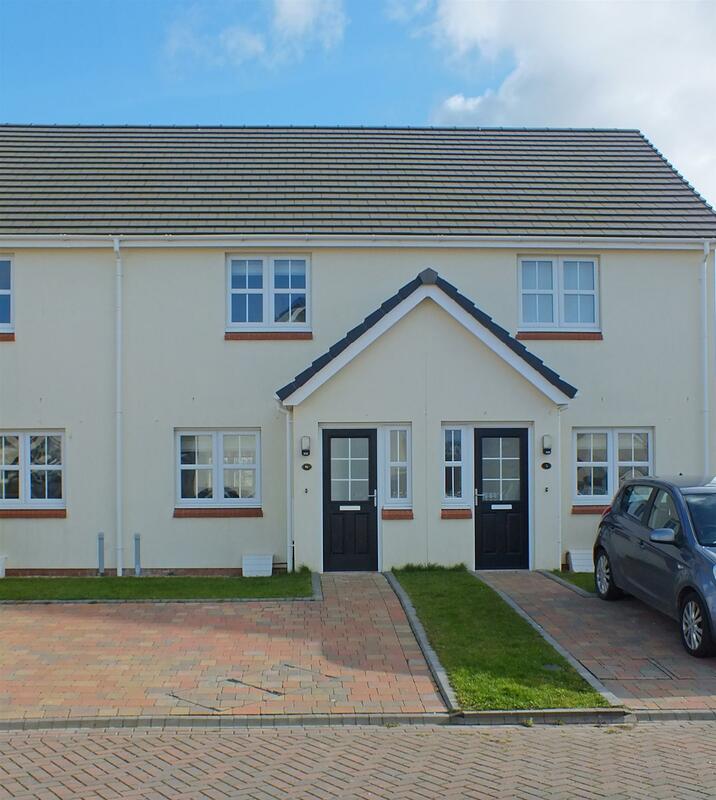 Spacious, Modern Yet Traditionally Built Terraced House on the Outskirts of Peel. A Short Distance from the Main Bus Route. Walking Distance to the Town Centre. 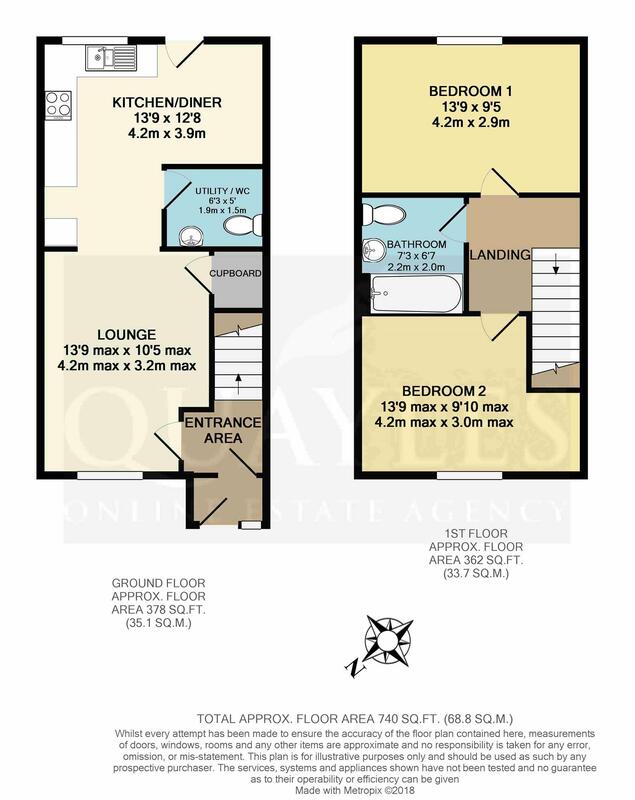 Immaculate Presentation Throughout, with Quality Carpets & Neutral Decor. Comprising Lounge, L Shaped Dining Kitchen & Utility / Cloakroom WC. 2 Excellent Double Bedrooms, 1 Enjoying Rural Views. Bathroom with White Suite & Shower Over the Bath. Gas Fired Central Heating & uPVC Double Glazing. Open Plan Frontage Incorporating a Generous Parking Space & Small Lawn. Ample Guest Parking Directly Opposite the Property. Enclosed Rear Garden with Block Paved Patio & Lawn. Completed 2016 & Benefiting from the Remainder of a 10 Year NHBC Warranty. Travel out of Peel up Peveril Road and onto the Ramsey Road. At the mini roundabout take the third exit onto Oak Road then turn left where number 6 Mcleods Field will be found a short distance along on the right. Having a half obscure glazed uPVC entrance door and a side window. Fitted matting. Half glazed door to the entrance area. Consumer unit. Double power point. Smoke detector. Door to the lounge. Stairs lead off to the first floor. A spacious room with a uPVC window to the front elevation. Numerous power points. Telephone and satellite points. Understairs cupboard. Clear opening to the kitchen. A spacious L shaped room with a dining area to one side. Fitted with a stylish range of coffee coloured base and drawer units together with contrasting wall units, work tops and upstands incorporating a 1 1/4 bowl stainless steel sink with a lever mixer tap. Inset four ring halogen hob with a glass splashback, brushed steel extractor above and a built in electric fan oven below. Space for a tall fridge freezer. Fully shelved larder unit. A uPVC door leads out to the rear patio and garden. Recessed low voltage downlights. Smoke and carbon monoxide detectors. Wall mounted 'Worcester' gas fired combi boiler. Multiple power points. 'Silavent' extractor. Easy care vinyl floor covering continues into the utility room. Plumbed for a washing machine. Fitted with a white suite of pedestal basin and push button flush WC. 'Silavent' extractor. Landing. Smoke detector. Double power point. Loft access. A superb double room with a uPVC window offering pleasant rural views to the rear. Numerous power points. TV, internet and phone points. A spacious room fitted with a modern white suite comprising push button flush WC, pedestal basin with a tiled splashback, mirror and shaver point. Panelled bath with a tiled surround, glazed screen and fully plumbed, thermostatically controlled shower. Recessed LED downlights. 'Silavent' extractor. Chrome ladder style towel warmer. Vinyl floor covering. A further spacious L shaped double room with a uPVC window to the front. Multiple power points and TV point. NB Measurement includes a deep recess suitable as a study or dressing area. Having a lawned area and block paved patio with gated access to the rear pedestrian walkway. Low maintenance uPVC fencing to boundaries. Exterior light. Open plan with block paved parking space and a small lawn. Exterior light. All mains services are installed. Gas fired central heating & uPVC double glazing. Fitted carpets, floor coverings and blackout blinds.